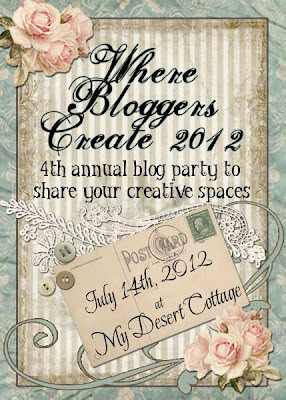 **My Desert Cottage**: Anyone need a new party dress??? With the Where Bloggers Create party just 1 month away, I thought I would offer a little blog special for everyone who is participating in the party, and would like to make their blog look fabulous in preparation for all the new visitors!! 20% off a custom design (regularly $135.00) This only happens once a year, and the offer will end once I'm too full to complete the work before the party, so now is the time to get a whole new look! 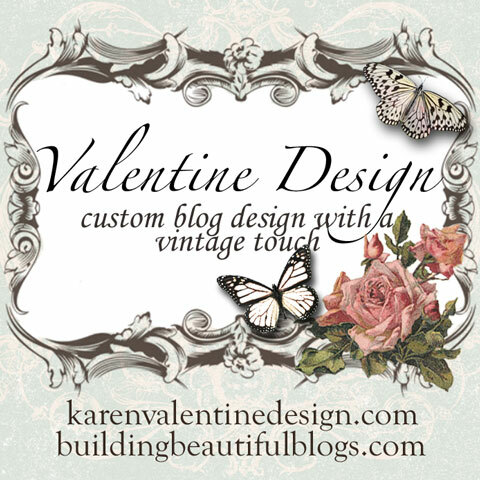 If you want to see some of the previous work I've done, just head over to Valentine Design. A $20.00 tune-up. This does not include any design work, but I will come over to your blog and do everything I can to spiffy it up! Is your header off center? I can fix it! Does your background look funny? I can give you the right template so it looks perfect! I will do what needs to be done to help you make a great first impression! I look forward to hearing from some of you!!! Hi - what timing - I want to create a blog! How do I apply the 20% discount to your Building Beautiful Blogs e-book? For some reason I thought your party was this weekend. I was starting to panic because it has rained so much the last week (weekS actually) and there just wasn't enough light to make good pictures. So when the sun came out just a little bit yesterday afternoon, I took about 50 photos in 10 minutes. I am so relieved to realize that I still have a month to go! Thanks so much. I have been away from blogging for a couple of months, as I had to marry-off my daughter. I have been anxiously awaiting this year's party. My blog space is still a mess from wedding stuff but I will be ready. Thanks for the discounts, too. I am going to need some tweaks in the near future, not sure all will be ready before the party, setting up my new artist site and shop. I will be in touch about the design work as soon as all is in place. I still love my custom personalized blog design you did for me! Hello Karen I have emailed you about doing something for my blog. Look forward to hearing from you. Oh Karen -- your beautiful design for my blog has totally changed my blogging life -- I just cannot tell you how I love my blog and all that you have done for me. You are amazing in every way -- the best friend that a blogger could ever have! Hi Karen, I would love to include your Where Bloggers Create button on my blog. Where can I find the details I need to include it as a widget in my Wordpress blog's side bar, please?